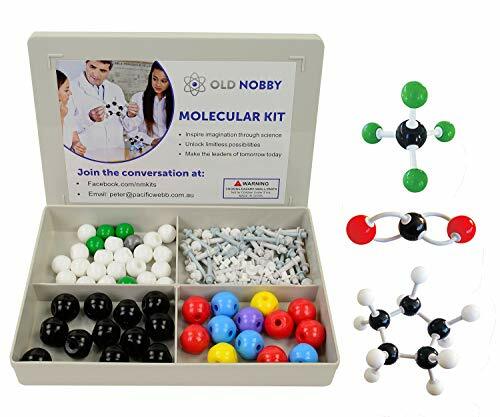 This Molecular Model Kit has a total of 115 pieces plus a link remover which makes is very easy to build models for Organic and Inorganic Chemistry models. ORGANIC CHEMISTRY MOLECULAR SET: The Educational molecular modeling set is designed for Easy Chemistry learning of organic, inorganic, and functional groups. The Molecular Model Kit is encourages an understanding of how to balance chemical equations and more advanced Science learning. Have fun while learning how to model organic structures, cyclic compounds, and stereoisomerism. CHEMISTRY MODEL KIT in 3D - This 3D molecular model kit clearly displays the connections between atoms which consists of 50 atoms and 64 flexible links that allows building of double and trible bonds. The hands on modeling kit for organic chemistry helps students from Grade 7 to Graduate level, have a clearer visualization of chemistry by demonstrating the structures & geometry of compounds. If you have any questions about this product by Old Nobby, contact us by completing and submitting the form below. If you are looking for a specif part number, please include it with your message.